The purpose of this Directive is to approximate the laws of the Member States on the controlled disposal of PCBs, the decontamination or disposal of equipment containing PCBs and/or the disposal of used PCBs in order to eliminate them completely on the basis of the provisions of this Directive. ‘disposal’ means operations D 8, D 9, D 10, D 12 (only in safe, deep, underground storage in dry rock formations and only for equipment containing PCBs and used PCBs which cannot be decontaminated) and D 15 provided for in Annex II A of Directive 75/442/EEC. Without prejudice to their international obligations, Member States shall take the necessary measures to ensure that used PCBs are disposed of and PCBs and equipment containing PCBs are decontaminated or disposed of as soon as possible. For the equipment and the PCBs contained therein, which are subject to inventory in accordance with Article 4 (1), decontamination and/or disposal shall be effected at the latest by the end of 2010. 1. In order to comply with Article 3, Member States shall ensure that inventories are compiled of equipment with PCB volumes of more than 5 dm3, and shall send summaries of such inventories to the Commission at the latest three years after the adoption of this Directive. In the case of power capacitors, the threshold of 5 dm3 shall be understood as including all the separate elements of a combined set. 2. Equipment in respect of which it is reasonable to assume that the fluids contain between 0,05 % and 0,005 % by weight of PCBs may be inventoried without the data required in the third and fourth indents of paragraph 3, and may be labelled as ‘PCBs contaminated < 0,05 %’. They shall be decontaminated or disposed of in accordance with Article 9 (2). If a Member State has already compiled a similar inventory, a new one shall not be required. Inventories shall be regularly updated. 4. In order to comply with paragraph 1, Member States shall take the necessary measures to ensure that the holders of such equipment notify the competent authorities of the quantities which they hold and of any changes in this respect. 5. Member States shall take the necessary measures to ensure that any equipment which is subject to inventory under paragraph 1 is labelled. A similar label must also be affixed to the doors of premises where such equipment is located. 6. PCB-disposal undertakings shall keep registers of the quantity, origin, nature and PCB content of used PCBs delivered to them. They shall communicate this information to the competent authorities. The registers may be consulted by the local authorities and by the public. The undertakings also issue to holders who deliver used PCBs receipts specifying the nature and the quantity thereof. 7. Member States shall ensure that the competent authorities monitor the quantities of which they are notified. 1. By way of derogation from Article 3 of Directive 75/442/EEC Member States shall prohibit the separation of PCBs from other substances for the purpose of reusing the PCBs. 2. Member States shall prohibit the topping up of transformers with PCBs. 3. Until such time as they are decontaminated, taken out of service and/or disposed of in accordance with this Directive, the maintenance of transformers containing PCBs may continue only if the objective is to ensure that the PCBs they contain comply with technical standards or specifications regarding dielectric quality and provided that the transformers are in good working order and do not leak. 1. Member States shall take the necessary measures to ensure that used PCBs and equipment containing PCBs which is subject to inventory in accordance with Article 4 (1) are transferred as soon as possible to undertakings licensed pursuant to Article 8. 2. Before PCBs, used PCBs and/or equipment containing PCBs are taken by a licensed undertaking, all precautions necessary to avoid any risk of fire shall be taken. To this end they shall be kept away from any flammable products. 3. Where reasonably practicable, equipment containing PCBs which is not subject to inventory in accordance with Article 4 (1) and which is part of another piece of equipment shall be removed and collected separately when the latter equipment is taken out of use, recycled or disposed of. Member States shall take the necessary measures to prohibit any incineration of PCBs and/or used PCBs on ships. 1. Member States shall take the necessary measures to ensure that all undertakings engaged in the decontamination and/or the disposal of PCBs, used PCBs and/or equipment containing PCBs obtain permits in accordance with Article 9 of Directive 75/442/EEC. 2. Where incineration is used for disposal, Council Directive 94/67/EC of 16 December 1994 on the incineration of dangerous waste (12) shall apply. Other methods of disposing of PCBs, used PCBs and/or equipment containing PCBs may be accepted provided they achieve equivalent environmental safety standards — compared with incineration — and fulfil the technical requirements referred to as best available techniques. 3. Member States shall individually or jointly take the necessary measures to develop, if appropriate and taking account of Article 4 (3) (a) (ii) of Regulation (EEC) No 259/93/EEC (13) and Article 5 (1) of Directive 75/442/EEC, installations for the disposal, decontamination and safe storage of PCBs, used PCBs and/or equipment containing PCBs. the labelling of the transformer after its decontamination must be replaced by the labelling specified in the Annex hereto. 2. By way of derogation from Article 3, Member States shall ensure that transformers the fluids in which contain between 0,05 % and 0,005 % by weight of PCBs are either decontaminated under the conditions laid down in paragraph 1 (b) to (d) or disposed of at the end of their useful lives. 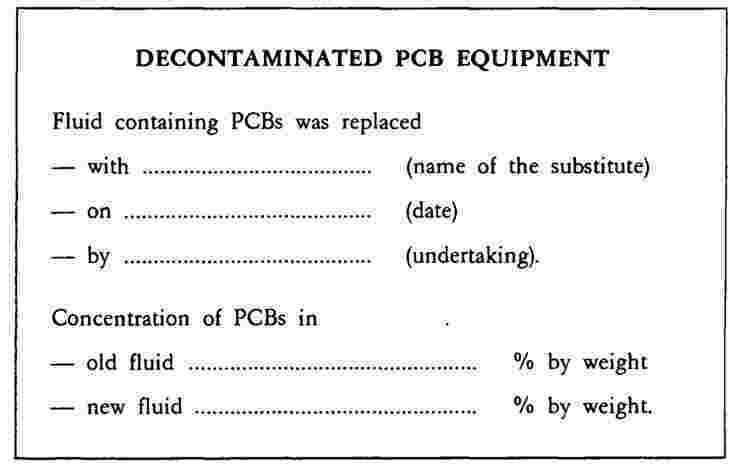 shall if necessary determine, solely for the purpose of Article 9 (1) (b) and (c) other less hazardous substitutes for PCBs. outlines for the collection and subsequent disposal of equipment which is not subject to inventory in accordance with Article 4 (1), as referred to in Article 6 (3). 2. Member States shall communicate these plans and outlines to the Commission without delay. 1. Member States shall take the necessary measures to comply with this Directive not later than 18 months after its adoption. They shall forthwith inform the Commission thereof. 2. When Member States adopt these provisions, these shall contain a reference to this Directive or shall be accompanied by such reference on the occasion of their official publication. The methods of making such reference shall be laid down by Member States. 3. Member States shall communicate to the Commission the texts of the provisions of national law which they adopt in the field governed by this Directive. The Commission shall inform the other Member States thereof. 1. This Directive shall enter into force on the date of its adoption and Directive 76/403/EEC shall be repealed with effect from that date. the reference in Article 2 (j) of Regulation (EEC) No 259/93 to Article 6 of Directive 76/403/EEC shall be construed as a reference to Article 8 of this Directive. Done at Brussels, 16 September 1996. (1) OJ No C 319, 12. 12. 1988, p. 57. OJ No C 299, 20. 11. 1991, p. 9. (2) OJ No C 139, 5. 6. 1989, p. 1. (3) Opinions of the European Parliament of 17 May 1990 (OJ No C 149, 18. 6. 1990, p. 150) and 12 December 1990 (OJ No C 19, 28. 1. 1991, p. 83). Common position of the Council of 27 November 1995 (OJ No C 87, 25. 3. 1996, p. 1) and Decision of the European Parliament of 22 May 1996 (OJ No C 166, 10. 6. 1996, p. 76). (4) OJ No L 108, 26. 4. 1976, p. 41. (5) OJ No L 262, 27. 9. 1976, p. 201. Directive as last amended by Directive 94/60/EC (OJ No L 365, 31. 12. 1994, p. 1). (6) OJ No C 122, 18. 5. 1990, p. 2. (7) OJ No C 138, 17. 5. 1993, p. 1. (8) OJ No L 194, 25. 7. 1975, p. 39. Directive as last amended by Commission Decision 94/3/EC (OJ No L 5, 7. 1. 1994, p. 15). (9) Ministerial Meeting of the Oslo and Paris Commissions of 21-22 September 1992. (10) OJ No L 194, 25. 7. 1975, p. 23. Directive as last amended by Directive 91/692/EEC (OJ No L 377, 31. 12. 1991, p. 48). (11) OJ No L 186, 12. 7. 1991, p. 64. (12) OJ No L 365, 31. 12. 1994, p. 34. (13) OJ No L 30, 6. 2. 1993, p. 1. Regulation as amended by Commission Decision 94/721/EC (OJ No L 288, 9. 11. 1994, p. 36). (14) OJ No L 42, 12. 2. 1987, p. 43.